After our epic flight from Istanbul, we settled in the hotel in Muscat, went shopping and put the bicycles back together with some help from Tom. It’s great to be cycling again with our friends Holger, Sebastian and Tom. We did a trip together in the Middle East in January, 2011, and a trip in Morocco in January, 2012, although Sebastian was unable to be there. 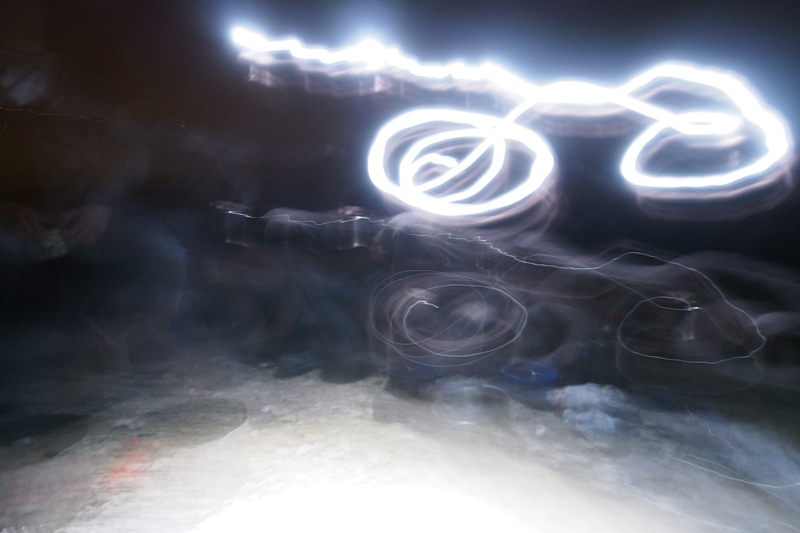 We seem to have set a trend by cycling in desert countries. Packing the bikes in Muscat. Cycling out of Muscat was fairly straight forward and before long the city, and its traffic, was behind us and the open road lay ahead. The warm weather has been a welcome change from the last six or seven weeks of cold winter weather in Europe. We’ve had temperatures between 24 and 28 degrees in the shade and mostly full sun. We had to dig up the sun glasses and sun screen. Optimistically, all our rain gear was left behind in Muscat. We camped in a lovely spot off the road on our first night out. 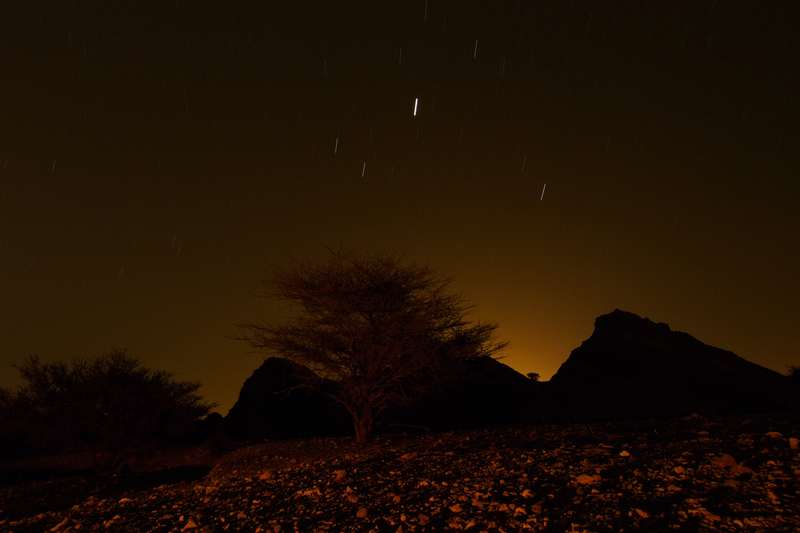 I love camping in the desert. It stays fairly warm here after sunset. Not much need for a sleeping bag. We made a small fire and sat around catching up on what’s been happening in our lives while making dinner. I slept like a baby that night, still trying to make up for the lost sleep on our trip from Istanbul. Walking in to the hills to find a camp spot. Holger and Tom cooking dinner. 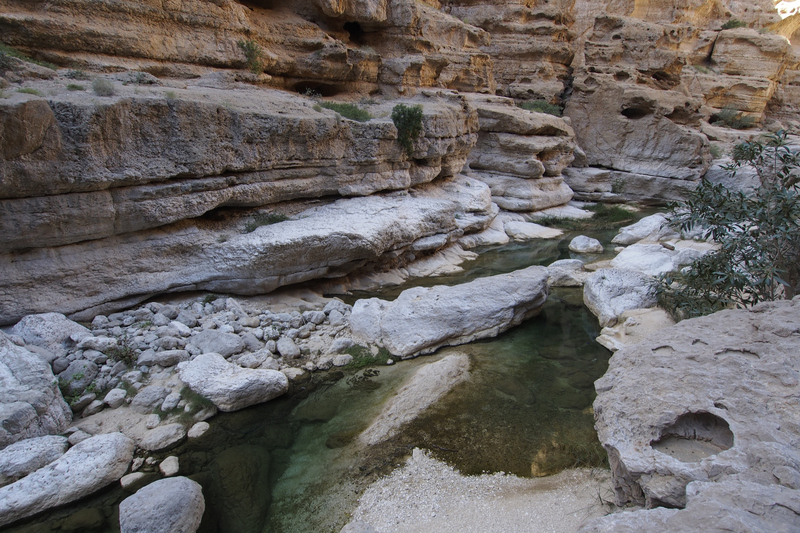 Our first destination of note was Wadi Shab, about 250 KM south along the coast. 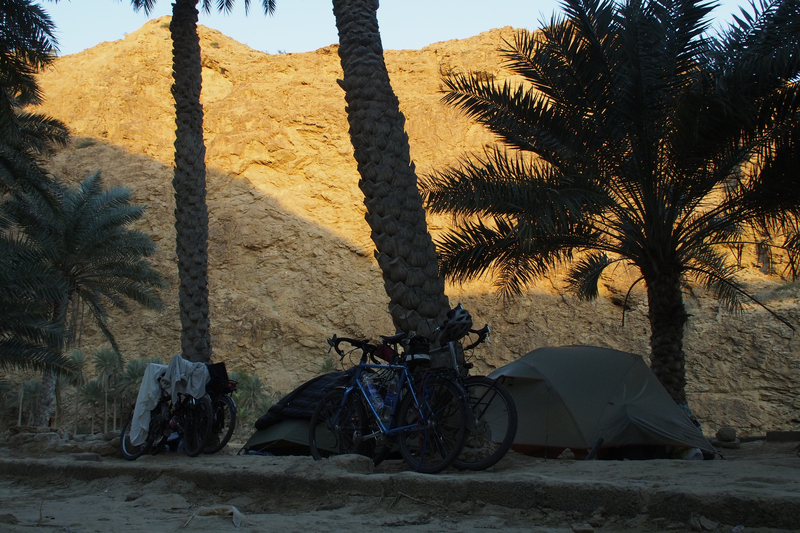 We arrived there after three days of cycling and camped at the entrance to the Wadi in the village of Ash Shab. 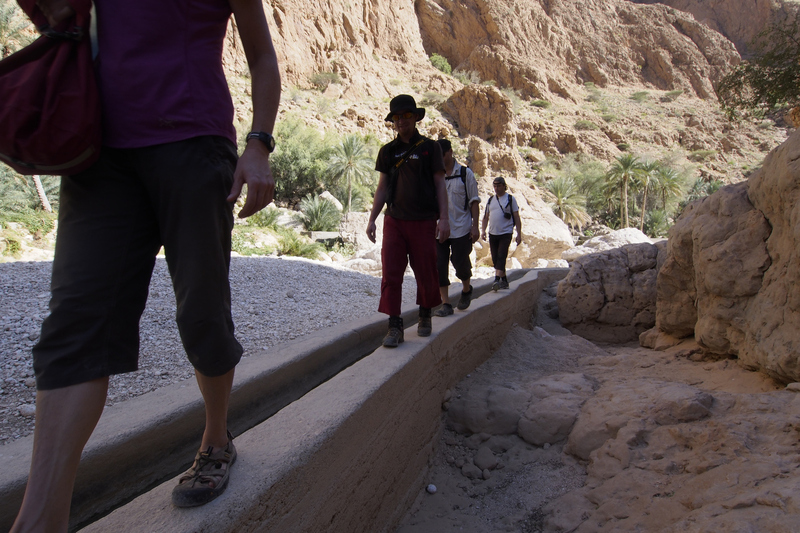 Jan descending a steep road into Wadi Shab. 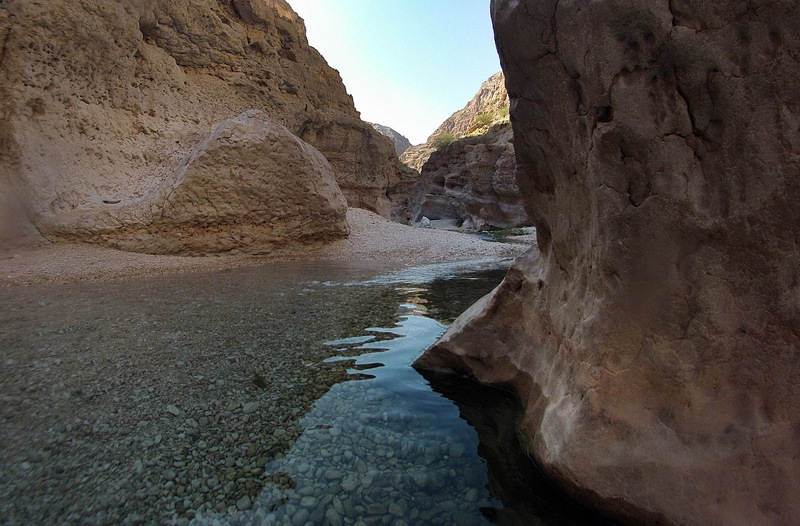 Our camp in Wadi Shab. 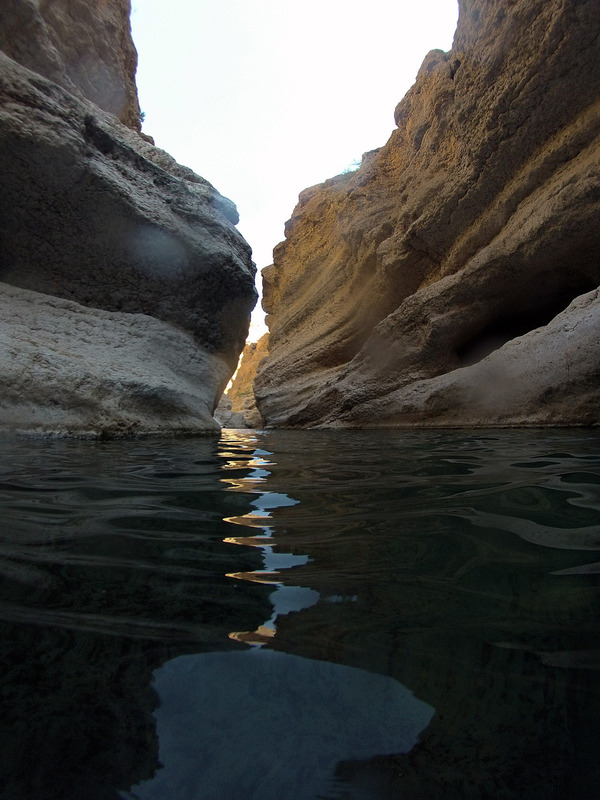 In the morning we took a small boat across and hiked into the wadi. With its steep canyon walls, palm trees and crystal clear water, this is a place where I could spend some time. It’s beautiful. After an hour’s hike, the first leg of our triathlon, we arrived near a large pool and the second leg of our triathlon. 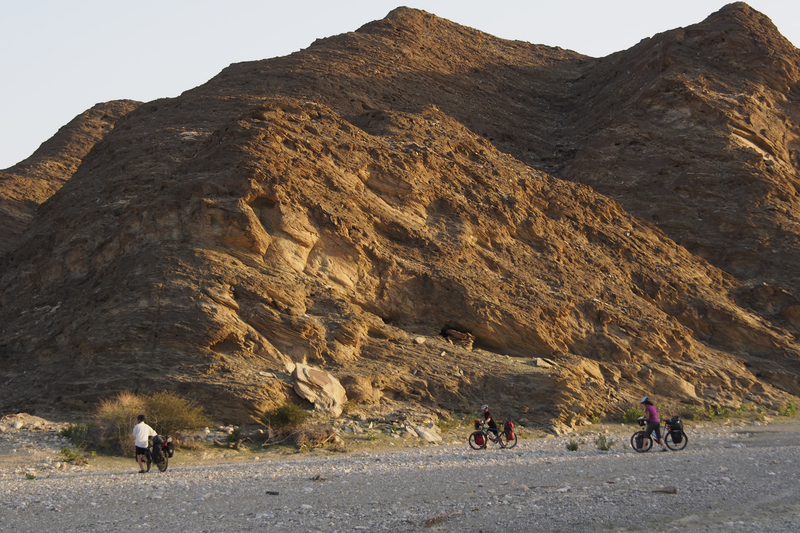 We doffed our clothes and took to the water, swimming and wading further into the wadi, the second leg of our triathlon. 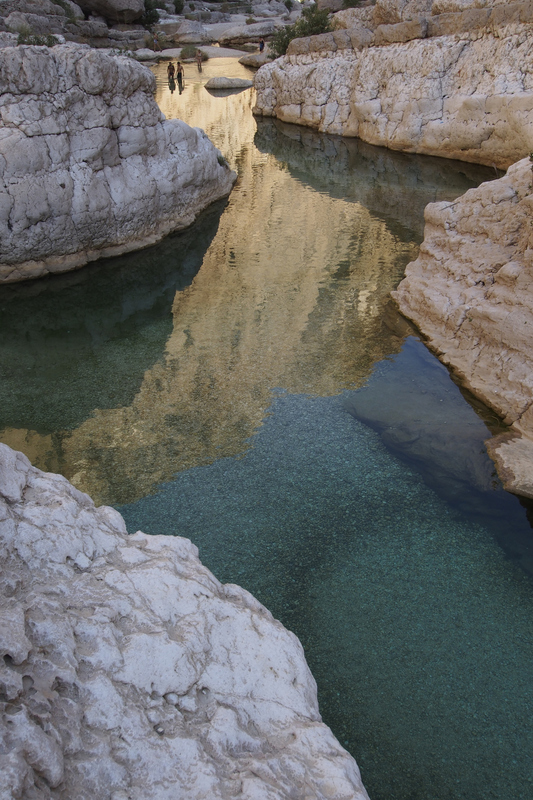 Crystal clear pool in Wadi Shab – the start of the swimming leg of the triathlon. 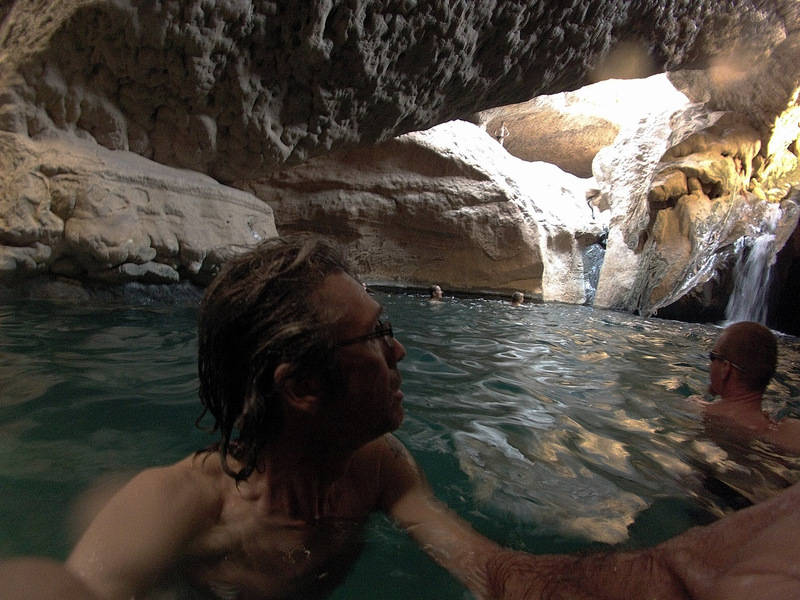 The canyon got narrower and narrower and deeper as well so you can only proceed by swimming. At the water level we experienced there remained only a narrow gap just above water, wide enough to get your head through. Once through this narrow passage it opens up into a large gallery created by fallen boulders and water erosion. It’s a beautiful cave-like space with openings above where daylight comes in. It’s deep and one has to tread water here constantly with taking breaks clinging to the rock walls. 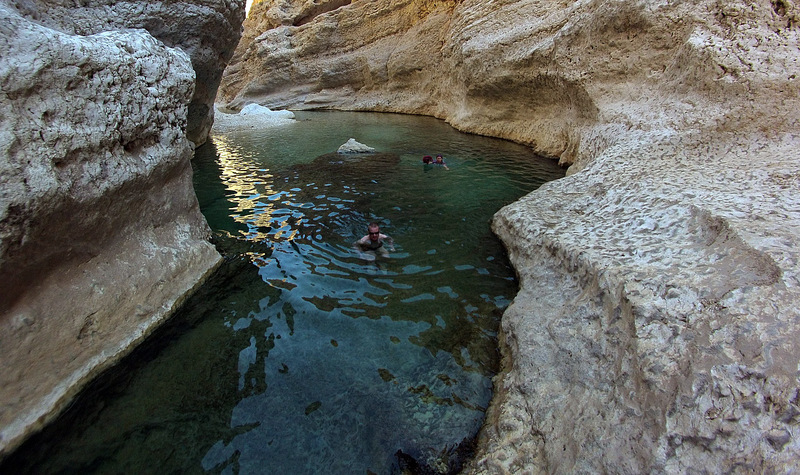 Jan and Sebastian swimming further into Wadi Shab. 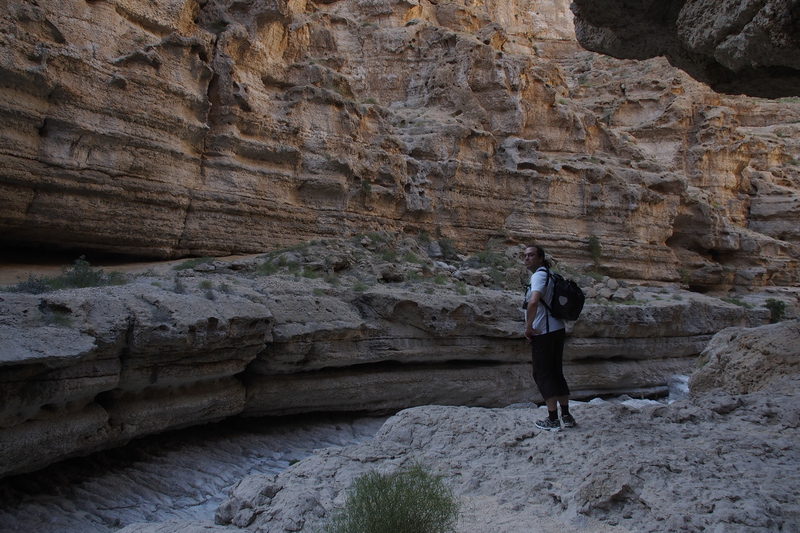 Jan trying to keep her camera dry in Wadi Shab. After a while we had to swim out again as the water was not all that warm and we got tired, so we retraced our route back to where we started and sought out sunshine to warm up. Having almost no body fat anymore after 7 months of cycling, we sat shivering in the sunshine, eating some snacks and trying to warm up. The coast on our way to Sur. 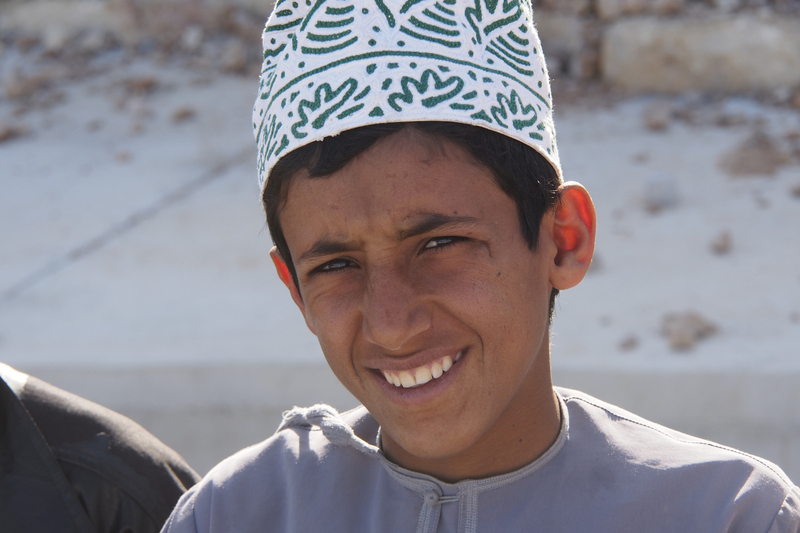 A boy I met on the road to Sur. We hiked back to where we had camped to have lunch and got on our bikes for the 45-kilometre ride into Sur, the third leg of our triathlon. We checked into a hotel, jamming all the bike bags into the elevator with Jan, had showers and went looking for a place to eat. 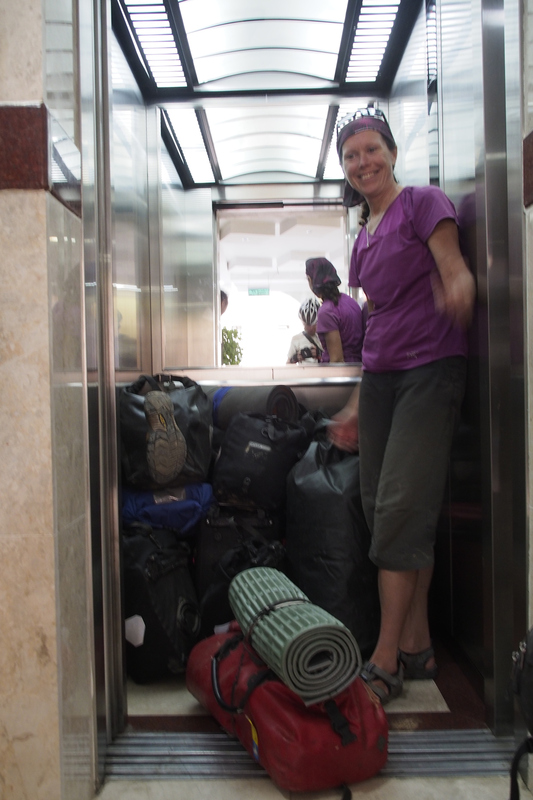 Jan with all the luggage in the hotel in Sur. 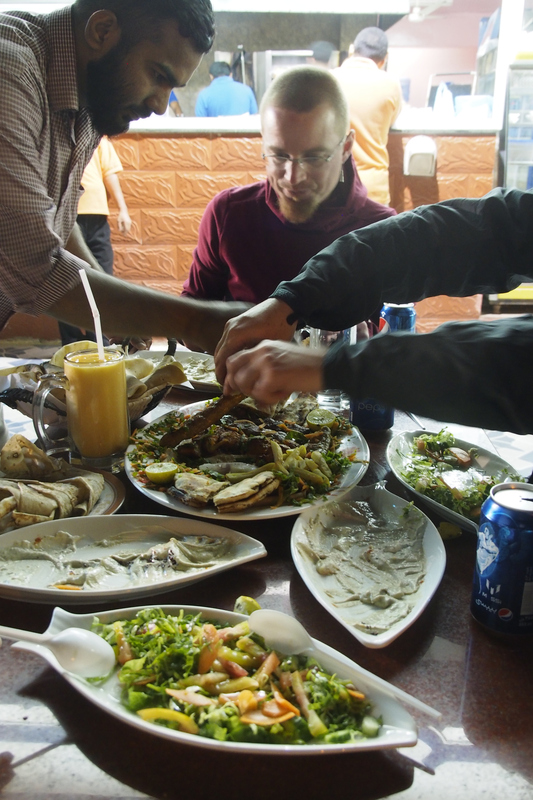 We ordered a mixed grill for five with various meats, bread, hummus, tahini and salads and followed that with another mixed grill for three as we were quite hungry. Afterwards, we walked back to our hotel but not before visiting the pub in the hotel across the street. Oman is a dry country, except for certain hotels and restaurants where you can buy alcoholic beverages. 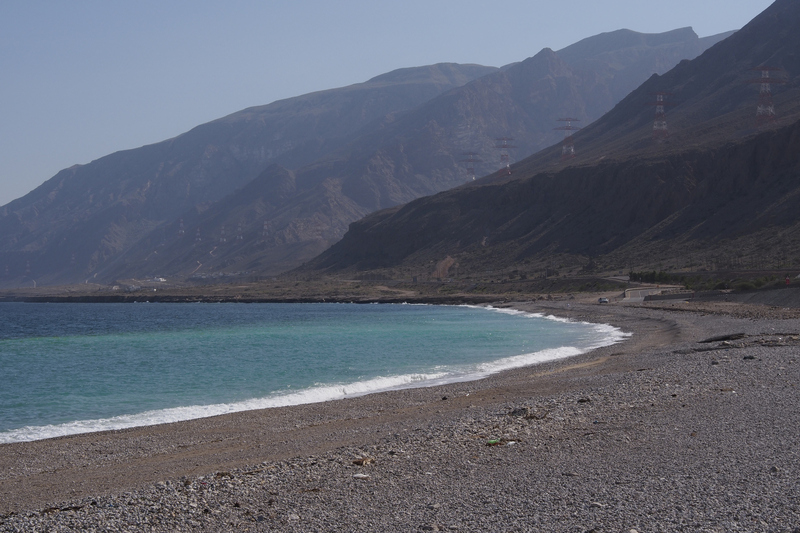 It was our first beer in Oman, and since you can’t stand on one leg for long, we had a second before going to bed. Magical, Jimmys. I love the idea of such triathlons. The heat would be welcome here. Snowing today, yeyyyyy. Smashing but, where’s the tear gas!!! Great pictures! I love the one of Jan trying to keep her camera dry!! !